Блог Андрея Бызова (АБ). Больше ЛМК в России. - "With the increased use of modern, lightweight building materials to create elegant, flexible designs, we've also seen an upsurge in the problem of structural vibrations." "With the increased use of modern, lightweight building materials to create elegant, flexible designs, we've also seen an upsurge in the problem of structural vibrations." Virginia Tech team reduces structural vibrations with simple, groundbreaking device. Easy to set up, tune, and move, the portable tuned mass damper can be placed in areas with excessive vibrations, hidden away in a cupboard, or integrated into a building's design. A revolutionary portable device invented by Virginia Tech architecture professor Mehdi Setareh with help from students promises to make structural vibration-reducing technology universally accessible. The PTMD - or Portable Tuned Mass Damper - significantly improves on existing technology by making it more compact, affordable, simple to set up and tune, and easy to integrate into a structure's design. 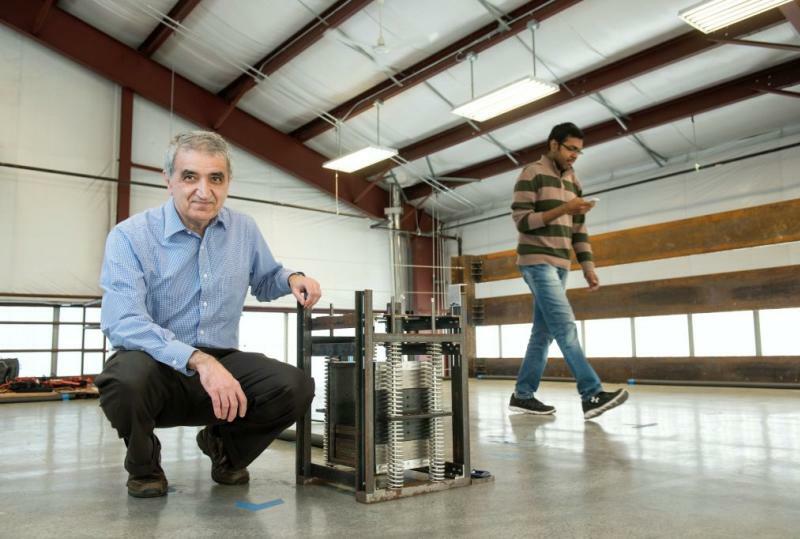 The device has reduced vibrations by as much as 40 to 75 percent in tests at Virginia Tech's Vibration Testing Lab, as well as in campus buildings and a footbridge in Clifton Forge. "With the increased use of modern, lightweight building materials to create elegant, flexible designs, we've also seen an upsurge in the problem of structural vibrations," said Setareh, a professor in the School of Architecture + Design in Virginia Tech's College of Architecture and Urban Studies and founder/director of Virginia Tech's Vibration Testing Lab. "While these vibrations are not necessarily dangerous, they can be disturbing to people and interfere with sensitive equipment and instrumentation. The PTMD improves upon an expensive and complicated dampening system by offering a cost-effective alternative that's easy to manufacture and use." Tuned mass dampers are used worldwide to mitigate vibrations in structures like buildings and bridges, where excessive movement can be alarming or even sickening to occupants. They're famously employed in landmarks like London's Millennium Bridge, Trump World Tower in New York, and Taiwan's Taipei 101 skyscraper, where they help minimize swaying from foot traffic and wind. The vast majority are multi-ton devices that occupy an average of 1,000 square feet and are complex and costly to install, tune, and maintain. Setareh's PTMD presents a revolutionary alternative to its behemoth forefather. Smaller than a nightstand and under 275 pounds, the device can be easily set up and adjusted by nontechnical personnel using a $5 iTunes application and Setareh's instructions. The PTMD also can be easily integrated into the construction of a building or added as a post-construction corrective measure. Its small footprint means it can be conveniently hidden away in a cupboard or even incorporated as a design feature. "The nice thing about these units is that they are portable and it's easy to fit them inside the furniture. You can move them around and you can tune them easily," Setareh said. "We are able to use them both as a fix or as part of the original design. You can cut down on the cost of construction by using lighter steel beams, and with devices like this, you can economically cut down the movement and vibration." Setareh has applied for a patent on the device and is working with students from the College of Architecture and Urban Studies and the College of Engineering to perfect it for commercial and industrial applications. They're also working on new prototypes that can be integrated even more easily and effectively into building designs. Setareh plans to package the device and place it on the market as a kit of parts. Each unit will include instructions on how to assemble, install, and tune it. Even though the units are mostly maintenance-free, the dampers may need adjustments every few years, depending on their level of use. These adjustments can easily be made by the consumer by following the re-tuning instructions included with each PTMD unit. The PTMD shows great promise for use in such settings as theaters, malls, nightclubs, and monumental staircases, where high-traffic floor vibrations can be unsettling or frightening to occupants. It also holds strong potential in settings like hospitals and labs, where sensitive equipment demands very small environmental vibrations. A nationally recognized expert on structural vibration, Setareh's 36-year career as an engineer has focused on using technology to study and enhance the interplay between structural design and vibrations. His work on minimizing vibration in a dramatic cantilevered corporate headquarters in Michigan and a monumental staircase at Michigan State University's Broad Art Museum earned national awards from the American Institute of Steel Construction for Innovative Design in Engineering and Architecture. Setareh began working on the PTMD in 2014 as part of a National Science Foundation grant-funded project. The two-foot-high, 15-inch-wide box, crafted by the technicians at the college's metal shop, consists of plates, springs, and dampers that are tuned to the natural frequency of a structure. It reduces vibrations by moving in the opposite direction of the structure, but at 10 to 20 times higher accelerations. Virginia Tech's Vibration Testing Lab is the only facility in the country dedicated solely to research on vibration serviceability issues. Created in 2011 with major support from the NSF and industry partners, the lab houses a two-story, full-scale steel structure, embedded with sensors, dynamic signal analyzers, and force platforms, and an assortment of sophisticated testing and measurement equipment. Students use the lab in course-related work and serve as researchers and test subjects studying and solving structural vibration problems. "This research has been invaluable for me to apply in my future career," said Sriram Sankaranarayanan, a master's student in civil engineering from Bangalore, India, who is one of Setareh's research assistants. "Floor vibration is a serviceability issue in many structures. The work I've done here will help me as a structural engineer who is interested in seismic design and analysis." "Our work in the Vibration Testing Lab was eye-opening for me," added Trey King, a third-year architecture student from Knoxville, Tennessee. "It challenged me to think beyond aesthetics and building function and consider how my designs affect occupants in terms of vibration serviceability."